Took this Sony STR-6055 out of storage this past weekend and still need to do a faceplate cleaning. Can't get the left channel to work either, but I'll open it up on Sunday and poke around inside. From what I remember, this little early 70s gem sounded really nice when it worked a couple years ago. I'll check it out and give you an update soon. 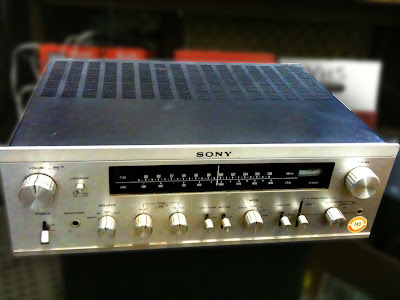 Have any stories about your Sony STR-6055 receiver? Leave a comment or shoot me an email. Thanks! What's it worth? In this condition (without optional wood cabinet) and not working well: $25. In excellent condition with wood cabinet - $65 or whatever a collector is willing to pay. I got this receiver when i was in college, 1970. It is still in excellent working order. Sounds great in a basement or garage system. I use it in my classroom (Physics teacher). A workhorse and a good sound for the time and ok for today. 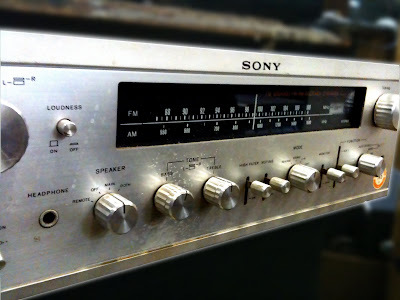 We have an old Sony ST-6055 with the wooden cabinet (I am assuming the wooden cabinet is the wooden grill and sides). We don't want to through it out but don't know who might want it and use it. Seems to work very well still. Had a 1996 era sony receiver working as the audio amp in a 2-channel HDTV system in the guest bedroom. It blew a power supply and remembered I had the 6055 stored in the attic. Just took it down and hooked it in. Lit right up. The power cord was sticky, and the control knobs were stiff initially. Sounds better than the one that died. 1971 purchase with wood cabinet. Yeah, power cords get sticky and they're almost impossible to clean. That aside, I'm glad to hear the Sony lit up and works for you! Thanks for chiming in. Just acquired one of these. Works OK but no FM signal. It just makes a faint crackling noise across the band. A great receiver. I have just purchased one but unfortunately the FM band is dead, just a faint crackle. The amp section works beautifully, I am guessing this is one of the finest sounding receivers ever produced. Vintage Sound - New and very cool! Vintage HiFi Site - Great Photos! HH Scott Site - Great photos and links to vintage HiFi Videos! Copyright 2010 HiFi Collector. Picture Window theme. Theme images by rion819. Powered by Blogger.